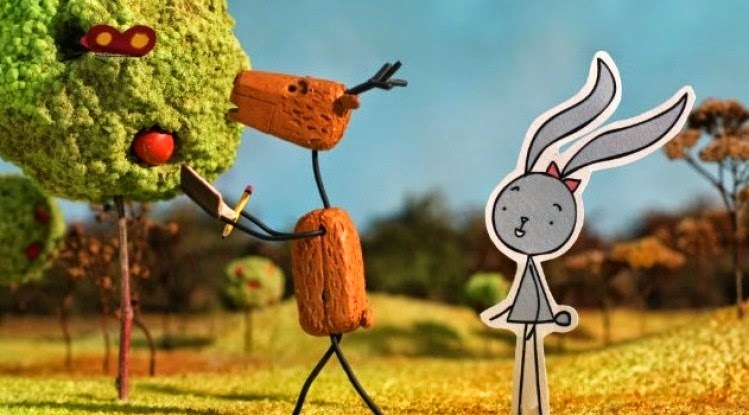 We keep saying that animation is an international field of endeavour, and 'Rabbit and Deer' (Nyuszi és Őz) from Budapest, Hungary is more proof of that. 'Rabbit and Deer' is a 16-minute animation from a final-year student at a Budapest University, Moholy-Nagy University of Arts ('MOME'). Péter Vácz showed the animation in 63 countries at 300 festivals - that probably took as much work and aggravation as making the darn thing - and won 120+ awards for it. This included top awards at American festivals in Nashville, Arizona and Atlanta, Georgia. You may want to watch the animation and decide if all this acclaim is deserved. You have to hand it to Péter in any event - producing a polished product and then also getting it out to the world in order to find an audience requires two completely separate and unique talents, and he apparently possesses both of them. It's not like Budapest is considered any threat to Hollywood, but with more talent like this, some day it might be. The video is amusing and has a nice background score of what I imagine is music with a Hungarian flavor. Since the extent of my knowledge of the music of eastern Europe pretty much begins and ends with 'The Third Man,' well, the music sounds as if it comes from Hungary at least. And the music is quite good, along with the animation. It is a light, effervescent animation designed to delight the eye, and it definitely succeeds. The juxtaposition of hand-drawn animation and stop-motion enhances the plot quite nicely. Incidentally, the enduring symbol from this film is a Rubik's cube. Did you know that the Rubik's Cube was invented by a Hungarian? Ernő Rubik. "Rabbit and Deer are living happily and careless until their friendship is put to the test by Deer's new obsession to find the formula for the 3rd dimension. After an unexpected accident, Deer finds himself in a new world, unknown to him. Separated by dimensions, the two characters have to find the way back to each other."